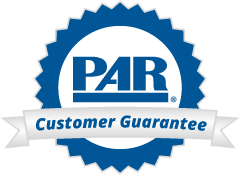 At PAR, we are committed to providing you with the absolute best Customer Service there is. In fact, our Customer Support Department has a special motto: "Be a Duck!" Ducks seem calm as they glide through water, but underneath, they are paddling furiously. This attitude—to do whatever it takes to make our Customers happy—is shared by everyone at PAR. In fact, all PAR staff members have a small rubber duck in their office as a reminder of this philosophy. We'd like to share some of our "Be a Duck" experiences with you. We hope you enjoy reading about what we do on a daily basis. At PAR, Customer satisfaction—your satisfaction—is our most important product. “You cannot imagine my surprise and delight at the CD you researched and then sent to me. You made my day—no, you made my entire week. What a wonderful gesture. I play it every day now at my office for the people I see and, of course, myself. Others should be made aware that you go above and beyond what is expected and that makes people loyal to your company. From this point on, PAR will be my go-to company for any psychological testing or other material that I need. I will also share your thoughtfulness and kindness with my colleagues and, whenever I can, I will direct them in PAR’s direction. "Approximately two weeks ago, I was trying to find an order source for a test but could not find it listed with any of the usual companies with which we do business. I called PAR and asked Genevieve Hughes if there were any way to find the test with your resources. Ms. Hughes could not find any mention of the test. Within a few days, however, I received a postcard with the address and e-mail of the author. With that information, we were able to find the source and order the test. Ms. Hughes certainly went the extra mile in Customer service, and we greatly appreciate her assistance. Too often only complaints are received by a company, but it is still excellent Customer service that makes my job so much easier and more pleasant." "I placed an order recently through Nick Vargo. He kindly sent a personal note by surface mail that acknowledged the nature of our conversation and offered to provide assistance in the future, if needed. I want to complement Nick, you, and others for adding this lovely touch to your client contact." A Customer had misplaced her test manual for the Trauma Symptom Checklist for Children (TSCC) and needed a quick way to score and evaluate the scale elevations on the TSCC she administered. Sending the manual to her using overnight delivery would not provide her with the information she needed quickly enough to prepare the report she needed for her early morning meeting. I remembered that we offer the TSCC Scoring Program and that the program produces a score summary and profile report. Although we do not offer a scoring service for the TSCC, I asked the Customer to provide me with the item responses by phone and the demographic information for her client. It took me only 5 minutes to enter the responses into our TSCC software program and prepare the report, which I quickly e-mailed to her. The Customer was very grateful and sent me this note: "Thank you so much, Ms. Dwoskin! You went above and beyond to assist me today and I really appreciate it!!! You were so helpful! I would like to compliment your Customer service skills and professionalism. Please forward a copy of this to your management as I'd like them to know what a good job you do! Thanks again."